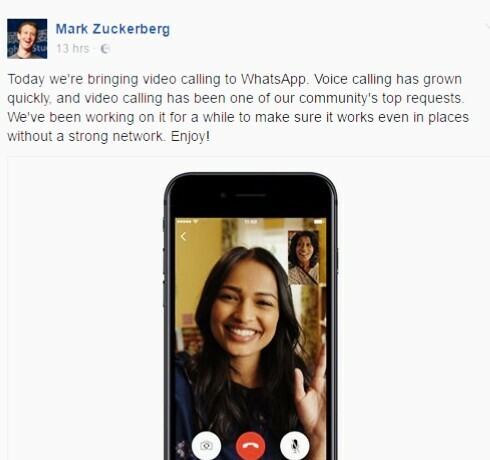 Mark Zuckerberg adds video calling on WhatsApp. ~ CK Jacob: Nigerian Fiction And Lifestyle Blog. Mark Zuckerberg adds video calling on WhatsApp. The CEO of Facebook, Mark Zuckerberg revealed the good news on his official Facebook page. Una Go Just Die For Nothing - Charly Boy! Break up or Make up?? The Agony Of A Childless Widow. My boyfriend is aggressive with my underwear! Ellah Mensah - I don't trust my daughter! 17 Interesting Facts About Dreams! Jackie Chan Awarded an Oscar after 56 years. 16 Interesting Facts About Sugar You Should Know. Tekno should be The Next Rated.